A fast track project completed between spring and fall semesters, this renovation at Washington and Lee University’s main library turned a small, dark auditorium into an inviting, light-filled, modern space that serves as an unexpected counterpoint to the red brick and colonnades of its beautiful, historic campus. The auditorium serves an important symbolic role as its it the first gathering space used by admissions tours to introduce the school and its history to prospective students and their parents. Additionally, the space served numerous other functions for the library staff, alumni and administration including annual board meetings and training sessions. The decisions to create a space that departed from the language of the other university buildings was intentional - the intention was to demonstrate that the school is both forward looking and progressive as well as rich in its traditions. We endeavored to create a space that was calm and serene - one capable of transporting the imagination. The interior is reinvented through the insertion of a light wood ribbon that simultaneously acts as a stage for speakers, a canopy for the audience and a screen wall at entry. 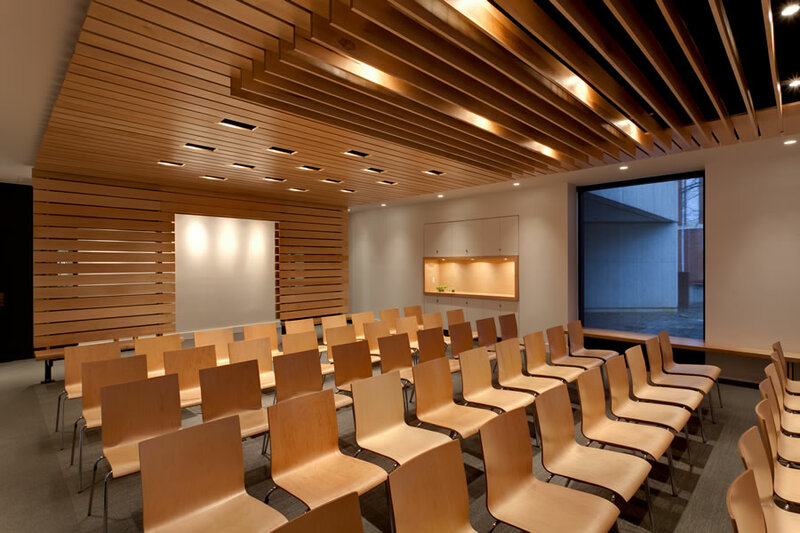 The light colored slatted maple floats in the room and is ‘completed’ by the placement of matching chairs to create a complete enclosure that draws upon images of a vessel. The wood canopy also adds acoustic baffling and conceals the lighting, audio and HVAC that are all integrated within it.